During 1904-05 Japan and Russia went to war over Russia’s expansionist policies and expansion into Asia and the Far East. Losses on both sides were very high and over 700,000 soldiers died. In the summer and fall of 1905 US President Theodore Roosevelt brokered a peace treaty between Japan and Russia. He brought both sides to Portsmouth New Hampshire to negotiate the terms of that treaty which became known as the The Treaty of Portsmouth of 1905. This historic treaty marked the formal end of the Russo-Japanese War and marked the beginning of a new era of diplomatic negotiations. President Roosevelt was awarded the Nobel Peace Price for his role in bringing the two warring nations together. 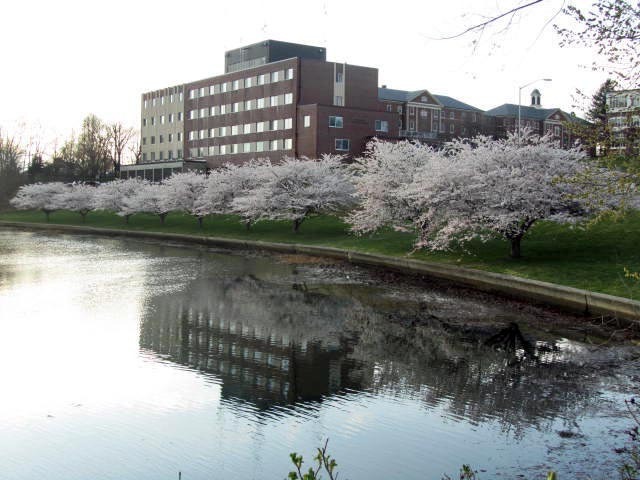 In gratitude Japan gave the United States 2,000 Cherry trees in 1910 which the US planted along the tidal basin and another park along the Potomac River. Most of those trees died from an insect infestation and Japan sent over another 3,000 trees in 1912 which fortunately lived. 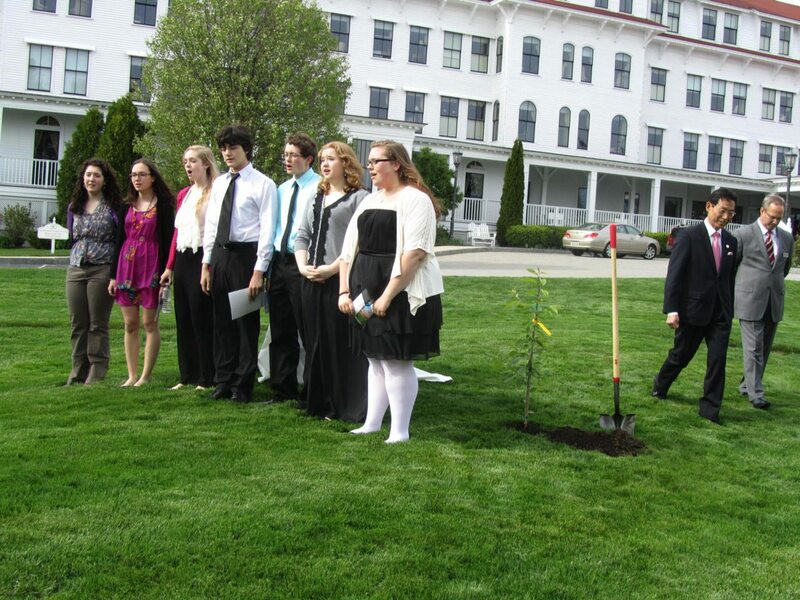 Today, 100 years later, the Japanese Government gifted the City of Portsmouth New Hampshire with three seedlings from the original stock of those historic trees and they were planted in places significant to the 1905 peace treaty. One of those spots was the Wentworth by the Sea Hotel where both sides stayed during the treaty negotiations. The other two locations in Portsmouth that received special Cherry trees today were the Strawbery Banke museum and the Portsmouth Naval Shipyard. 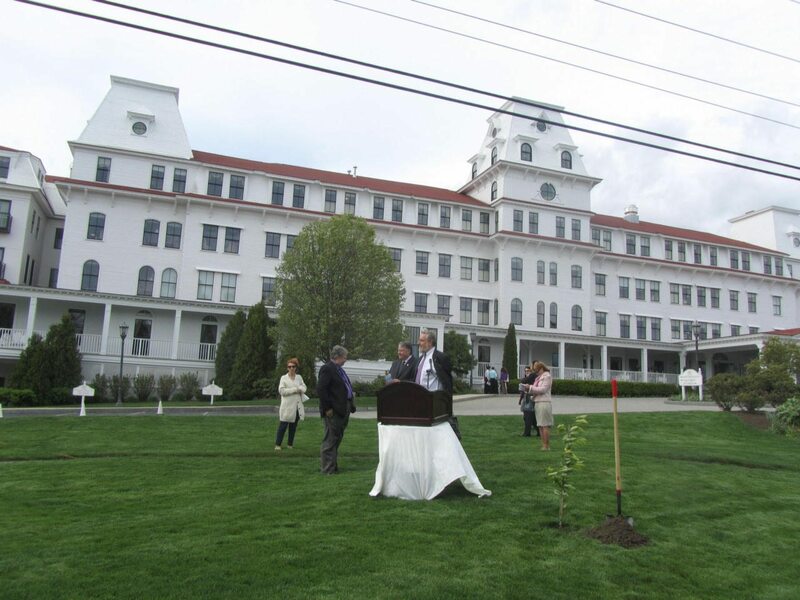 Ann Cummings and I attended the ceremonial tree planting at the Wentworth by the Sea Hotel. This was the scene at the Wentworth before the ceremony got under way. The little Cherry tree can be seen to the right of the white linen draped podium. It was pretty windy today and the maintenance guys said they had to dig a little hole in advance to set the tree in to keep it from blowing over. Below Japanese Consul General Takeshi Hikihara makes a few remarks before the ceremonial planting. 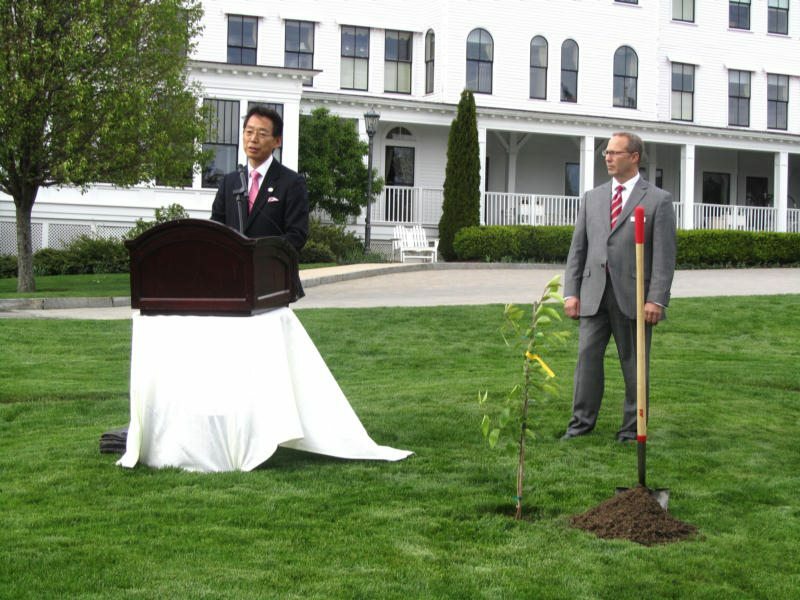 Below right General Hikihara and Wentworth General Manager Frank Wetenkamp plant the tree. You could tell neither of these gentlemen had very much shovel experience but they got it done. Also pictured is Charles B. Doleac, President of the Japan-American Society of New Hampshire. Afterward the Portsmouth High School Madrigal Singers performed “Sakura” a traditional Japanese folk song. Sakura is a traditional Japanese folk song depicting spring, the season of cherry blossom. The Portsmouth NH Peace Treat of 1905 is just one of the events that makes living in this beautiful New Hampshire Seacoast city so fascinating. Many spots in Portsmouth have been the scene of significant events in US and world history. If you have any Portsmouth or NH Seacoast questions please give us a call or email, Ann Cummings and I are happy to answer any area or real estate questions. Visit our website at NewHampshireMaineRealEstate.com to see all the Portsmouth NH and Seacoast listings for sale as well as listings in southern Maine.